Cayuga Lake is one of the Finger Lakes of western New York state. It is almost 40 miles long and, at 435 feet, is one of the deepest lakes in the United States. On the lake’s western shore, a short drive north of Ithaca, one will find Taughannock Falls State Park. The park’s signature feature is its 215-foot falls – 33 feet taller than Niagara Falls and the tallest single-drop waterfall east of the Rocky Mountains. The park does not disappoint when it comes to scenery. As is often the case when one finds a great waterfall, the surrounding land is extremely hilly and offers myriad opportunities and challenges for the casual hiker. 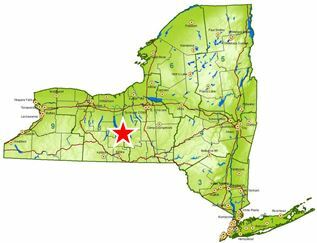 The late summer of 1983 brought three such hikers to western New York – my friend Jim (then a resident of Ithaca), my brother Dan, and myself. The day was clear and brisk and started out well enough for us. Maybe we should have been listening for the distant strains of “Dueling Banjos”. The key moment was when we decided it was time to stop following the course of the lazy stream that wound its way through the park, so we turned left and began to scale the steep sides of the valley we’d hiked into. If there was a way up, it was clearly this long upward stretch of broken slate that headed into the trees overlooking the valley. It was a little too steep to actually walk on properly, but it was manageable enough to half-walk and half-climb up the path. It was strenuous but doable. Jim, being the most fit of the three of us, got up to the trees first. He quickly realized that the apparent path we’d been on disappeared as it hit an impenetrable forest of trees and bushes. He announced that we’d have to go back the way we came, and I’ve never doubted his assessment of the situation or his recommended course of action. But as any good soldier knows, there’s a right way and a wrong way to execute a retreat. I chose poorly. It turns out that climbing down such a hill is far more difficult than climbing up one. The optimal approach, in retrospect, is probably to reverse the same moves that got you up there; that is, to go down feet first, still facing the ground. I opted to try walking down, facing down the hill. Even though I was doing so in a very crouched position, this approach had the effect of putting my center of gravity far too high and forward over my feet, which impelled me to walk down faster in order to keep up with gravity’s inexorable pull. I should have immediately seen where this was leading, but I did not. There was no good end game for the approach I had taken; acceleration begat acceleration. Within a matter of seconds, I was dashing down the hill at a furious pace, unable to slow down, my only hope being that I might reach the bottom of the hill before I lost my footing. I didn’t miss it by much; I was only about 20 feet from the bottom when I went pitching forward, landing face-first on a pile of crushed slate. I never lost consciousness, though it’s possible I sustained a concussion from the impact. I’d felt the stone shards tearing into my face. I’d kept my chin up, which saved me from losing any eyes or teeth, though one of my first thoughts was that my jaw must surely be broken. Jim and Dan caught up to me and helped me sit up. I don’t know whether they saw me go down or how quickly they realized that I was significantly injured. My jaw wasn’t broken, but there were two substantial wounds; one at the bottom of my chin and that other, the larger one, on the side of my chin. I could feel that a flap of flesh at least a couple inches long was hanging from the larger wound. And there was blood. I was exceedingly fortunate to be in Jim’s company that day. At the time, he was aiming at a career in medicine and he’d spent a couple summers riding around in ambulances in New York City as a summer job, so he was used to far worse than this. He immediately got me over to the nearby stream and explained that what we had in front of us was very clean fresh water. He washed out my wounds as best he could under the circumstances and bound me up with whatever clean cloth we had on hand. We then had to walk a mile or two back out of the park to get to the car – not an easy walk for me given my stunned condition, but I managed. As we drove to the hospital, fear began to creep in. At this point in my life, I was a full-time performer. I acted in shows constantly and had a regular job as a messenger for the Eastern Onion Singing Telegram Company. I’m not making this up. The possibility that I might have suffered a permanent disfigurement began to make me quietly frantic. I mean, I never had matinee idol looks to begin with, but this could have limited my castability even more. At the emergency room, the doctor looked at my wounds, cleaned them up a bit more, and got ready to stitch me up. It was time for me to make my plea. I explained to him that I was a performer for a living, so if there was anything he could do to minimize the potential for disfigurement or scarring, would he please do so. He nodded and promised to do what he could. By the time the stitches needed to come out, I was back home in Detroit. My sister Bev, lucky for me, was a registered nurse and she volunteered to take out the stitches for me. She expressed admiration for the suturing job the man in New York had done. She declared it the most precise job of its kind she’d ever seen. As for my poor face – there was some scarring, though hard to see from more than a foot away. If I get into just the right light, I can still see a crescent shaped line curling over the left side of my jaw, but if I’m looking for something to blame for any unsuccessful auditions I may have given, I’ll have to look elsewhere. And anyway, the lasting takeaway from this incident has nothing to do with scarring and everything to do with learning how not to climb down a steep hill covered with crushed slate.